I still have not met anyone with more than two degrees of separation from coffee. (0 being they themselves worked in coffee, one degree being they know someone who did, etc.) I need to learn not to be surprised by how people I meet are connected to coffee, but I still am. Analilia and I connected right away by talking about working as teachers, swapping classroom stories, and griping about bureaucracy of licensing. She’s currently working in Turrialba’s Special Education high school and has her Master’s in Special Education. When I mentioned my project, I found out she too knew coffee firsthand. Marie’s family came from France to Costa Rica in 1830, and has been involved in coffee since day one. Her ancestors had vast tracts of coffee fields and even a mill in San Jose, but gambled and drank a good part of it away. Her grandfather sold off what remained to development companies. A neighborhood of high rises in the San Jose suburbs still bears her family name. Her grandfather took the money from the sale of the lands to buy a slice of mountainside and cow pasture outside Turrialba. For various reasons the farm fell mostly into neglect, and Marie has been literally digging out the remains of what was an extensive coffee plantation. She just gave birth to her third child, and literally wanted to get back on the horse, so we road through the overgrown paths of the property on horseback, Marie eagerly assessing what had changed in the 5 months since she’d last surveyed the farm. In true Secret Garden style, we road through overgrown coffee fields now choked with weeds, but could see the red of ripe coffee cherries peeking out, here and there, from under leaves and branches. 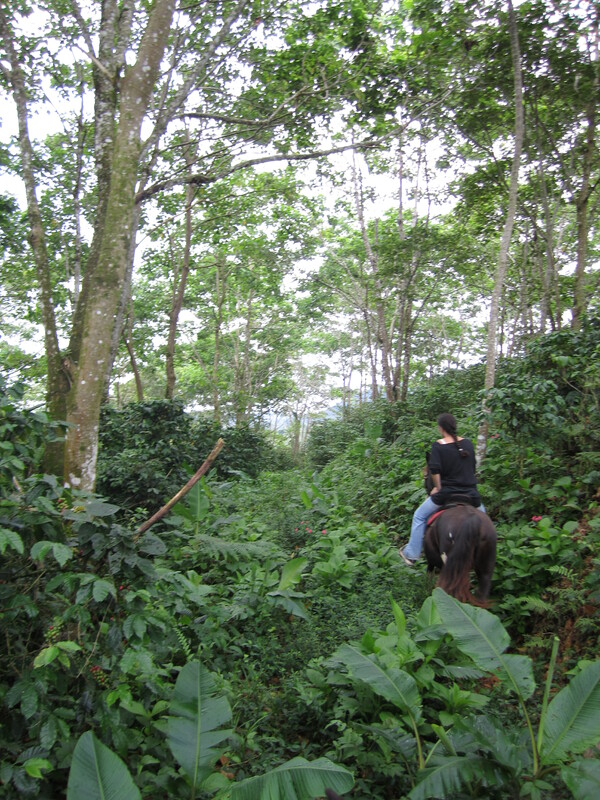 Marie was running the farm as organic, and field by field reviving the coffee production. But organic coffee farming is extremely labor intensive (all the work done by pesticides, herbicides, and fertilizers in conventional farming has to be done by human hands) and she only has 6 full time employees for 350 acres of coffee, sugar cane, bananas, some livestock, and of course some Pura Montaña. She reluctantly turned one field into conventional production, just to have some income. Now she’s working piece by piece to see what the other fields need to be rejuvenated. Some need more shade, some less. Others need ground cover to keep weeds out, others need new “living fences” to separate them from the sugarcane. The cool thing was that Marie didn’t have to do any guesswork; the coffee showed her exactly what its own optimal conditions were. ‘Fields’ that had essentially become full forests in the 14 years since anyone had tended them had also become self-conducted experiments. In the parts where the shade was too much, no cherries ripened. The same in areas with full sun. In the areas with just the right amount of shade, the coffee plants had branches heavy with ripe cherries. All Marie had to do to replicate the level of production was replicate the conditions that created it. All she needed were more hands on deck. Imperialism was a nasty business, and we’re still managing the fallout. People far more researched than I have espoused on all theories of “white guilt,” and it arguably all charities operating in developing nations are funded by “first world guilt.” We know that we had something to do- whether indirectly or directly, whether inevitably or intentionally- with the extreme poverty of millions from the unjust operations of so many first world companies. People are constantly debating the effectiveness/necessity of charities; do they serve just to assuage our guilt or do they actually ameliorate grave situations? Do first worlders have the responsibility to try to ameliorate? Do we have the right? Coffee is of course as much a part of this discussion as Nike sneakers, and there are plenty of coffee charities. Some operate apart from the sale of coffee, some attach themselves as a premium to the price we pay for a cup or a bag of beans. I’ve given to plenty of charities and actively abstained from giving to just as many for all the complex reasons contained in the discussions mentioned above. Right now I’m just trying to understand what I consume; because I consume a lot of coffee, and all of it’s in ignorance. Before I consider whether or not I, or anyone else, will/should “do something” to make the situation better, I want to know what “the situation” is. And that month and a half I’ve spent doing that has shown me that the year I’ve allotted myself to do nothing but will hardly be enough time to scratch the surface. While consumers furrow their brows at the prices and the maze of stamps on bags of coffee at the supermarket (“Is the Fair Trade worth another $2.16? How do I know that money is even going to the farmer? What if I get the one that’s Organic and Bird Friendly for just $1.83 more than generic? Does Organic mean that the farmers also make more? What does ‘Bird Friendly’ even mean? Can they still use pesticides and stuff on Bird Friendly farms? ), distributors and marketers are hard at work behind the scenes trying to extend sustainable certifications to a larger share of the market, but without any attempts to make it easier for consumers to buy coffee that we can be sure actually does something good for someone or someplace. At the International Coffee Organization’s Seminar on Certification and Sustainability Assessment on September 25th in London, Rainforest Alliance still used vast, vague phrases like, “workers enjoy better working and housing conditions, access to schools and medical facilities” to define the goals of granting farms/companies with their stamp. Having only been investigating the intricacies of coffee since February, I’m pretty far from an industry expert. But I have learned that unless you can control the sun and the slope of the hill-and maybe even then, growing coffee’s always going to be a rough business. What farmers want is to be compensated for dealing with that roughness. That didn’t seem to enter into the themes of the experts’ presentations. Out of respect for the courage it took this woman to tell her story, I won’t trivialize what she’s gone through by trying to condense it at the end of a quotidian blog post. Her story could actually become a book of its own. Maybe it will. What started as a conversation about coffee transformed into the story of her life, a story which proves that even when pushed past the limits of what’s right, what’s fair, what’s humane, people can recover. Suffering has many shapes, and no nation, no bank account, no hero has dominion over resilience.